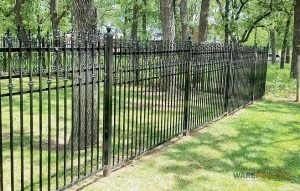 Tall Iron Fences Are Great For Marking Property Lines And Protecting Kids Or Pets. Across the country, some of the most beautiful homes of all time are protected by elegant and durable wrought iron fences. These fences have been around since the 18th century, and with good reason! Wrought iron is incredibly durable, as well as classically beautiful. Available in a variety of different styles, heights, and prices, wrought iron can be used in a variety of circumstances, and on almost any home. If you are hoping for a new installation, or wrought iron fence repair in Crowley and Fort Worth, TX and the surrounding areas, don’t hesitate to give us a call at 817-948-4503 today! There are many different benefits in choosing a wrought iron fence for your home, and as fencing professionals, we truly enjoy installing them. To begin, the sight of a wrought iron fence is very appealing, thanks to the elegant craftsmanship, and the sturdy build. A fence that offers sleek aesthetics in addition to sturdy protection, iron is often protected with durable powder coatings in order to protect it from rust and chips. this ensures your fence, and its finish will remain intact and beautiful for decades to come. Another benefit of iron fencing is the wide variety of styles you have to choose from. Shorter fences are great for marking property lines without obstructing your view, and taller fences can keep even the most determined intruder from entering your home. Additionally, with proper installation, your fence will be resistant to fire, as well as incredibly difficult to tear down or break through. Tall Wrought Iron Fencing Adds Elegant Protection To Your Property. If you do happen to notice any imperfections with your fence, our professionals do offer quality wrought iron fence repair in Crowley and Fort Worth, TX and the surrounding areas, as well as a variety of other fencing repairs, fencing installation, and fencing replacement services. Here at Ware Fencing, we use only the highest quality materials in all of our projects, and we follow a strict standard of craftsmanship. Our contractors will work with you through each step to make sure you get the fence you’re looking for. Give us a call today at 817-948-4503 to schedule your appointment and ask for a quote. We have been leaders in the residential, commercial, and farm fencing industries for years, and we look forward to helping you with all of your fencing needs! Updated on September 20, 2018 at 9:04 am by Ware Fencing.